Is My Pet a "Senior"? 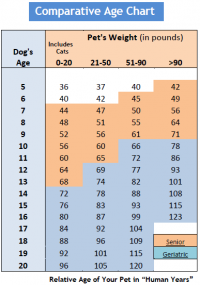 Pets age faster than people. You have probably heard that one year in a human's life equals seven "pet years". This is actually fairly accurate (see chart to right). Many factors affect aging; species, breed, weight, nutrition and even environment. Pets are now considered a "senior" at 7 years of age. As dogs and cats age, they, like people, have a greater risk of developing certain diseases and conditions. However, when such diseases and conditions are detected in their early stages, it makes it possible to delay the progression and possibly treat to cure these conditions. Dr. Wayne Johnson, your Virginia Beach Veterinarian, wants to help you take good care of your pets as they age. Because our pets age faster than we do, they can develop diseases and conditions in a short period of time. For this reason, our animal hospital recommends our patients to have a thorough evaluation at least every 6 months. This evaluation includes a thorough and complete physical exam, dental/oral exam, intestinal parasite screening, heartworm and tick disease screening, and individualized vaccination recommendations. When your pet is seven years old or older annual blood chemistry profiles, complete blood cell counts, urinalysis, and thyroid testing are recommended. Other tests that may be recommended (depending on your pet's age and condition) are; EKG, X-rays and abdominal ultrasound. After test results are received, the doctor will discuss the results with you and any needed treatments, further testing, and/or nutritional changes. Even when normal, these tests give us very valuable "baseline data" on which to compare future results and detect even small changes early in the course of disease. In the case where a condition is found, you'll know that it was found as early as possible and treatment can begin. This way we can work with you to help your pet live a long, healthy, and happy life. A blood chemistry test that checks twelve different values concerning the kidneys, liver, cholesterol, proteins and blood sugar. This can show us signs of liver or kidney disease, diabetes, dehydration, and many other conditions. Checks levels of sodium, potassium and chloride. Normal electrolyte values are critical for proper function of the heart and muscles. Abnormalities can be an indication of multiple diseases. A complete blood count test checks the number and appearance of the different types of blood cells. Abnormalities can indicate many conditions including anemia, infection and parasites. This test tells us a lot more than whether there is a urinary tract infection. It can also warn us about problems with the kidneys, liver, hydration, urinary crystals and stones, and diabetes. Radiographs of the chest can warn us of problems developing with the heart, lungs, trachea, esophagus and other structures. The EKG or ECG gives us a view of what is going on electrically within the heart. This tracing can warn us of abnormal heart rhythms and give us an idea of existing enlargement or compression of the heart chambers. As in people, an elevated blood pressure can cause problems with the heart, kidneys, eyes and other organs. This is a fantastic way to examine the organs of the belly. The ultrasound allows us to safely and non-invasively examine the inside of the organs. It can alert us to problems developing, sometimes before they even show up in the blood work or urine. Our Virginia Beach, VA veterinarian, Dr. Wayne Johnson, sends our abdominal ultrasound images over the internet to a radiologist. This specialist reads the images and consults with our doctor about your pet's case. As reading and interpreting the images is what the radiologist does all the time, he/she may pick up subtle changes that would otherwise go unnoticed.